My Chilled Kale and Corn Chowder is Gluten-Free, Vegan, and DELICIOUS. | Keep It Up, David! 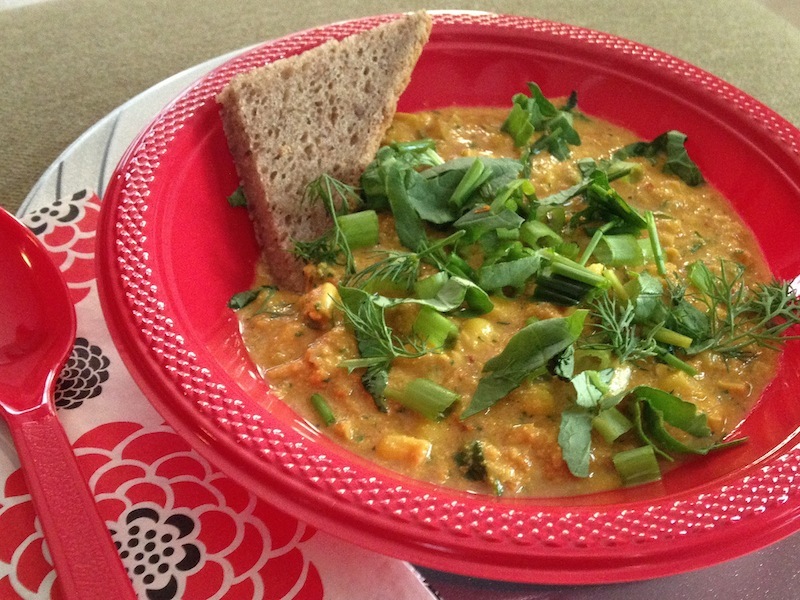 My Chilled Kale and Corn Chowder is Gluten-Free, Vegan, and DELICIOUS. How did you spend your Saturday afternoon? I spent mine soaking my nuts. Get your minds out of the gutter! I’m talking about cashews. I had no idea that soaking nuts was a thing. It’s popular among folks that follow a raw diet, and vegans as well, and they do it for a few reasons. It makes digesting nuts easier, and increases the absorption of nutrients. It also softens them up, which makes them easier to puree and blend (as vegans use nuts in recipes to replace ingredients derived from animals). It also apparently heightens the flavor – especially if you roast the nuts after you soak them. I’m all for increased nutrient absorption, but I soaked these cashews because they were destined for the blender. 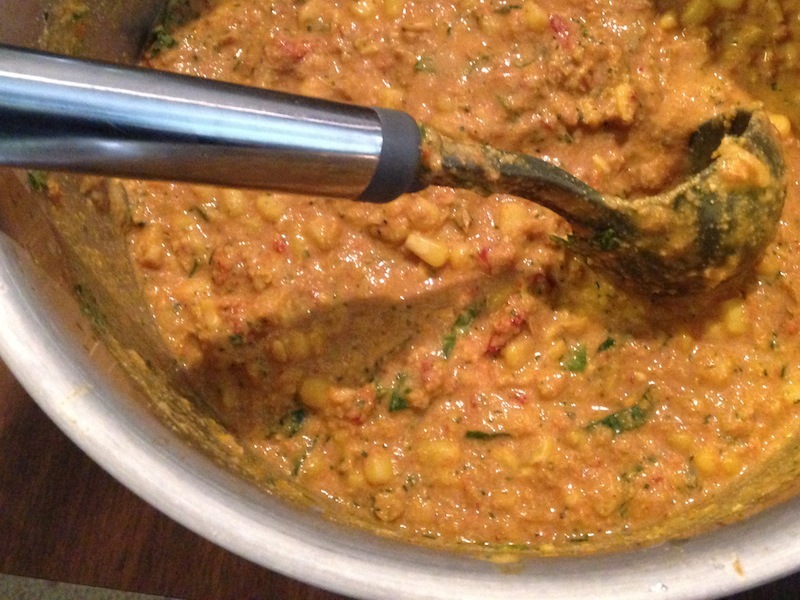 I made a dish for a crowd of friends on Saturday, and that crowd included a few vegan and gluten-free devotees. Even though I’m a carnivore and a gluten eater, I love vegan food, and enjoy making new things. So I decided on a Chilled Kale and Corn Chowder that everyone could enjoy. I based it on this recipe (with my own modifications), and since it started with soaked cashews, that’s that I did. This recipe will yield 5-6 cups of chowder, but I ended up tripling it on Saturday. I made A LOT of chowder! 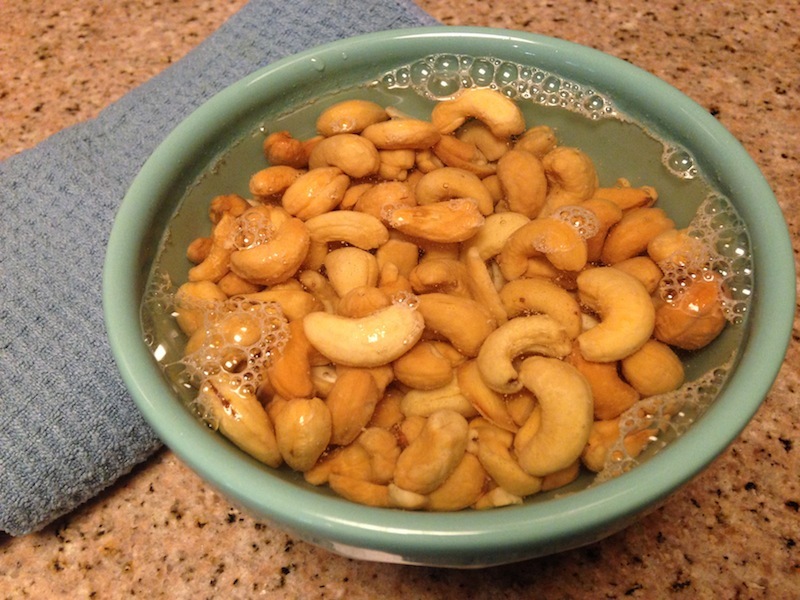 Soak 1/2 cup cashews in water for at least two hours. When you’re ready to start making the chowder, drain and rinse them. Then set them aside… because you’re not done soaking! 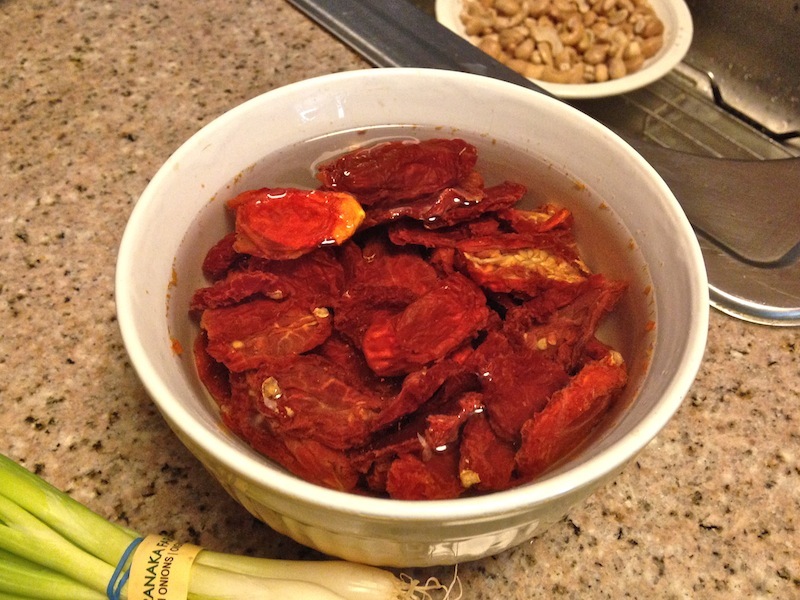 The other item you have to soak is sun-dried tomatoes – about 2 ounces of them. I found them in the bulk food section, near the dried fruits, and I covered them in warm water and set them aside. If all you can find is jarred sun-dried tomatoes packed in olive oil, than you won’t need to soak them. Just drain them well! Blend it until it’s completely smooth. No lumps. No grit. If you taste it at this point, like I did, it’s going to seem overwhelmingly potent and spicy. That’s okay – this is just the base of the chowder. There’s a lot more to add! RELATED CONTENT: Another Great Summer Chilled Soup: Watermelon Gazpacho! 3/4 of your soaked sun-dried tomatoes, drained. (Set aside the remaining 1/4, you’ll need them later). Blend, blend, blend. You won’t be able to get it super silky smooth, but make sure the kale and tomatoes are finely chopped. one more handful of kale, sliced into ribbons. By not blending everything, you get a nicer, chunkier texture, like a chowder should have. Stir is all up, and you’re done! Pop it in the fridge until it’s time to serve. 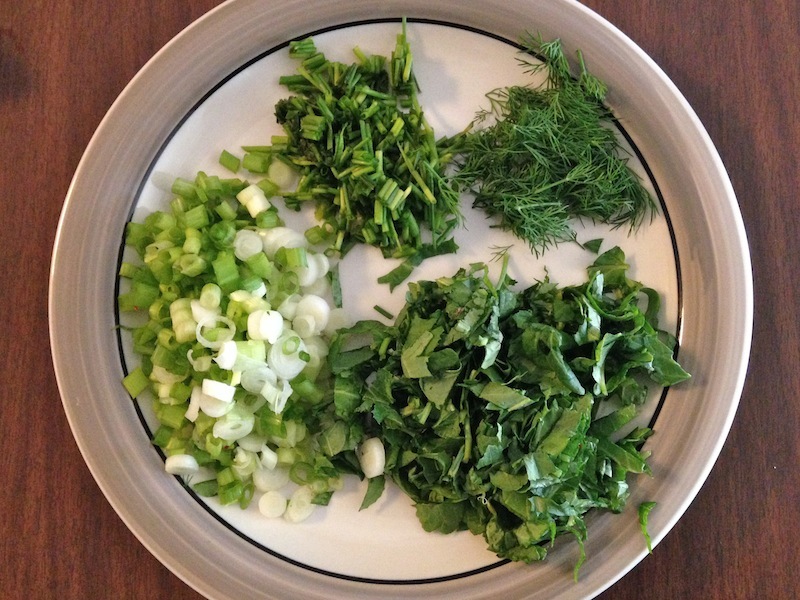 For garnishing purposes, I chopped up some more scallions, dill, chives, and kale, which I served next to the chowder, so people could top it how they liked. I also toasted up some bread (vegan and gluten-free), and cut it into triangles. This chowder is flavorful. The first thing that hits you are the spices – particularly the paprika and cayenne. It’s very smoky, and with a touch of heat, but then the fresh, bright flavors of the corn and tomatoes come through, with bright accents from the herbs and greens. It’s wonderfully complex, and was a hit with the crowd. And man, this chowder is good for you! It has two superfood ingredients (kale and turmeric), plus all the good fats and proteins from the cashews. I’m glad I had a lot left over! Check out many more healthy recipes on my Recipes page! This entry was posted on Monday, August 10th, 2015 at 12:09 am and is filed under Uncategorized. You can follow any responses to this entry through the RSS 2.0 feed. You can leave a response, or trackback from your own site.